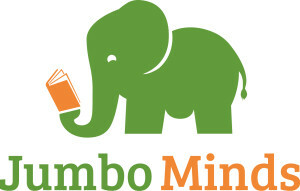 You are here: Home / Blog / About Jumbo Minds / Welcome to Jumbo Minds! The Jumbo Minds founders love – love – love science! My sister and I graduated from college with a biology major and chemistry minor, and my sister also taught science and math in elementary, middle, and high school. One day, while on vacation, she and I were talking about how to share this love with our children. I had a toddler at the time, and used to do silly things like blow on a house plant and say, “Here’s some carbon dioxide, plant!” Then I’d take a deep, exaggerated breath and say, “Oh – thaaaank you for the oxygen! !” As topics occurred to me, I’d have conversations with my kiddos about digestion, precipitation, photosynthesis, and temperature, to name a few. My sister and I realized that, while it was easy for us to speak ‘science’ with our children, many other parents haven’t had the same exposure we’ve had. That could make science harder to discuss! We hatched a dream to write science books for children. This dream, to share science with children, parents, and teachers, has been slowly growing. Our blog posts will describe some of the things we’ve learned along the way. Stay tuned!